Summary: Some will be a little disappointed to find Corpses not nearly as blood-drenched as might be expected. The much-delayed horror extravaganza from cartoon metal superstar Rob Zombie finally graces our screens, virtually two years after original distributor Universal refused to release it for being ‘too extreme.’ What we get in fact is an amusing, sometimes inventive, horror pastiche that may induce the odd wince but is unlikely to trouble sleep too much. Drawing on one of the classic horror plots, the film sees four plucky teens driving around the backwaters of America digging for dirt on legendary deranged killer Dr. Satan. When they break down in the middle of nowhere during a torrential downpour, a pretty hitch-hiker kindly takes them back to shelter at her nearby family home. And then things start to get really nasty, with the girl’s oddball family introducing the kids to a world of fear and pain beyond their darkest nightmares. Zombie’s film is a fast-moving, colourful horror that chews up and spits out pieces from the entire history of the genre, particularly the ‘nasties’ of the seventies such as The Texas Chain Saw Massacre’ and ‘Last House on the Left’ (even the title is a likely homage to z-grade slasher ‘House of Seven Corpses’). What it strives for, and so dearly lacks, is the naturally unsettling atmosphere of these films; rarely managing to delve beyond a comic exterior to deliver high-voltage shocks. It also feels like that Zombie is trying just a little too hard to prove himself as a ‘proper’ film director at times, padding the action out with irritating flourishes like the multitude of shots seeped in negative that seem better suited to a music video rather than a horror movie. Still, it thankfully amounts to much more than the bland, tame teen horrors that have rolled off the Hollywood sausage machine in recent years (I Know What You Did Last Summer et al), perhaps because it is such a labour of love for its eccentric director. 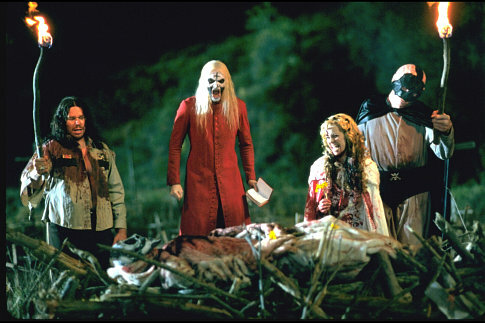 House of 1000 Corpses is an altogether nastier affair (witness the ‘fish-boy’! ), and yet, after all the hype, some will be a little disappointed to find Corpses not nearly as blood-drenched as might be expected – mainly, you have to assume, due to cuts imposed on the picture by those darn censors. There are a collection of effective moments, such as the slow-burning execution of a policeman, and many will be surprised at how well made the picture is. It is only in the last twenty minutes that the film really comes into its own however, in a fabulously inventive carnival of terror that suggests what the film could have been if Zombie hadn’t been content to simply ape his favourite movies. But hey, this was never meant to be high-art, and for the horror cognoscenti this is a fun ghost train ride to the dark side. Cult success is all but guaranteed; fans will be pleased to note that a sequel is already on the cards.